Yarrow (Achillea millefolium) is an herb with fernlike foliage and blooms that span the rainbow: yellow, red, white, pink, orange and purple. Yarrow blooms attract hummingbirds and butterflies from early summer through fall. It is extremely easy to grow, as it likes poor soil and no watering. Plant yarrow in an area that gets full sun to part shade. You can amend the soil a bit with compost, but yarrow will grow in very poor soil as long as it is well drained. Avoid beds near downspouts or marshy areas. Yarrow grows best in sandy soil with a pH level that ranges from 6.0 to 6.5. Sow yarrow seeds in the spring as soon as the soil can be worked. Place the seeds about 12 to 18 inches apart. Cover the seeds with a light dusting of soil and water gently. 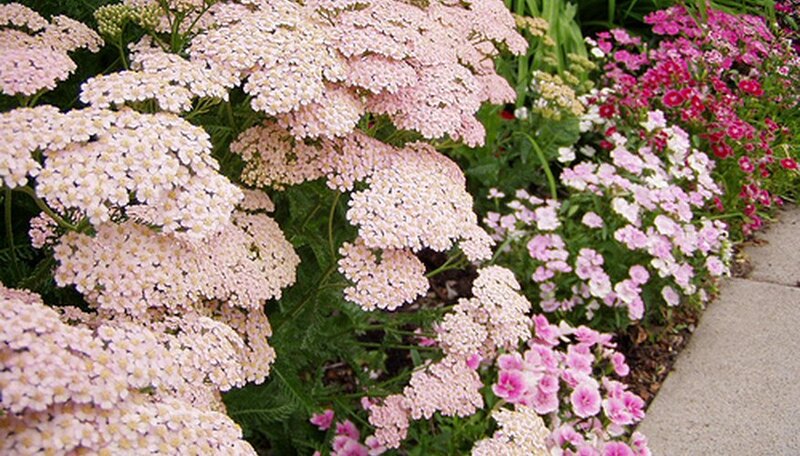 Yarrow plants can take up to two years to become established, so consider buying the plants directly from a nursery. Place yarrow in a pot to overwinter or simply to use on your patio. The plants do well in containers because they prefer to be dry. Yarrow grows as a perennial in U.S. Department of Agriculture (USDA) Hardiness Zones 3 to 9. In areas with cold winters, yarrow often dies back to the ground but returns in the spring. Propagate yarrow by division or stem cuttings. Divide the rhizomes in the fall and plant. For stem cuttings, trim off about 6 inches of new growth. Remove 2 inches from the bottom of the cutting and dip in rooting hormone. Plant the cutting in a garden pot with seed-starting soil and place in a sunny location. Keep the soil from drying out for at least three weeks or until the plant is firmly rooted. Yarrow will get long and leggy if you fertilize it. If yarrow does get too leggy, cut the plant back and it will quickly grow back. Yarrow is extremely drought resistant. Regular hand watering will kill the plant; let nature water it for you. If left to its own devices, yarrow can become an invasive weed. Keep it trimmed back to size, and deadhead the plants when the flowers start to fade. Do not compost the seed heads.